The report also notes that “the City must also start preparing for the next recession, which would inevitably weaken its revenue growth.” And it even includes an analysis of a recession scenario. The Salinas Taxpayers Association believes that numerous local governments in California face the prospect of bankruptcy when the next recession comes. In fact, we believe that some elected officials at local governments see Chapter 9 bankruptcy as a politically comfortable way to avoid making tough decisions that would provoke special interest groups to initiate recall campaigns or election opposition. 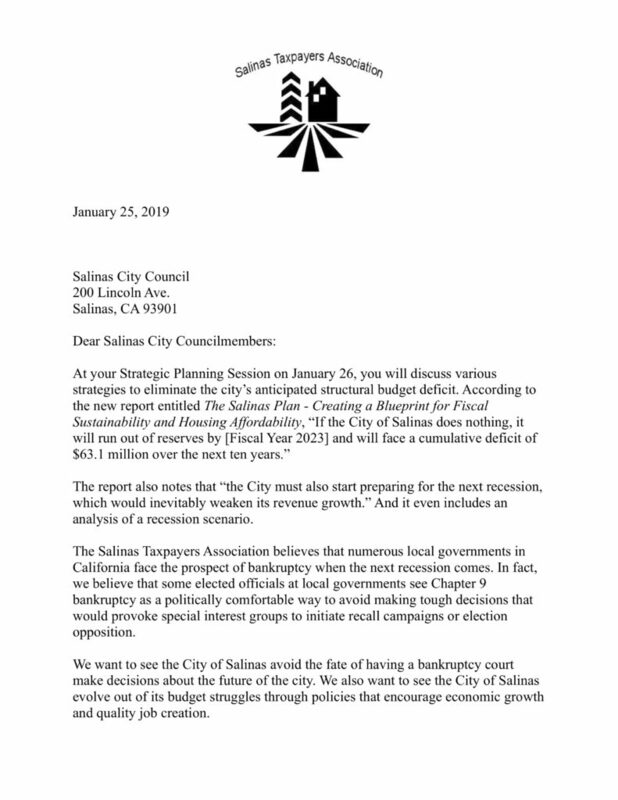 We want to see the City of Salinas avoid the fate of having a bankruptcy court make decisions about the future of the city. We also want to see the City of Salinas evolve out of its budget struggles through policies that encourage economic growth and quality job creation. 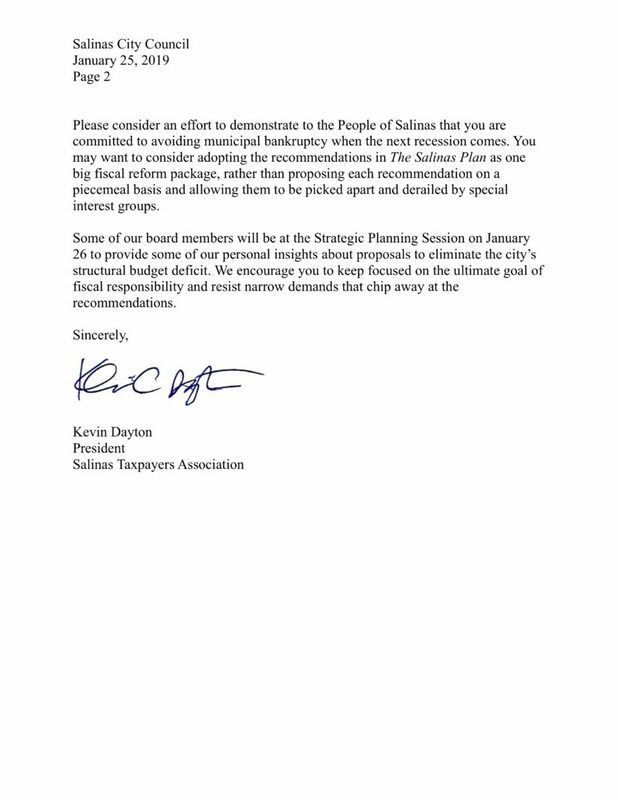 Please consider an effort to demonstrate to the People of Salinas that you are committed to avoiding municipal bankruptcy when the next recession comes. You may want to consider adopting the recommendations in The Salinas Plan as one big fiscal reform package, rather than proposing each recommendation on a piecemeal basis and allowing them to be picked apart and derailed by special interest groups. Some of our board members will be at the Strategic Planning Session on January 26 to provide some of our personal insights about proposals to eliminate the city’s structural budget deficit. We encourage you to keep focused on the ultimate goal of fiscal responsibility and resist narrow demands that chip away at the recommendations.